Rosie needed somewhere in her garden where she could relax and unwind but her husband also needed a garden shed for storing all his tools. The Connor Painted Cabin from Rowlinson Garden Products solved both these problems as it is divided into two useful spaces. 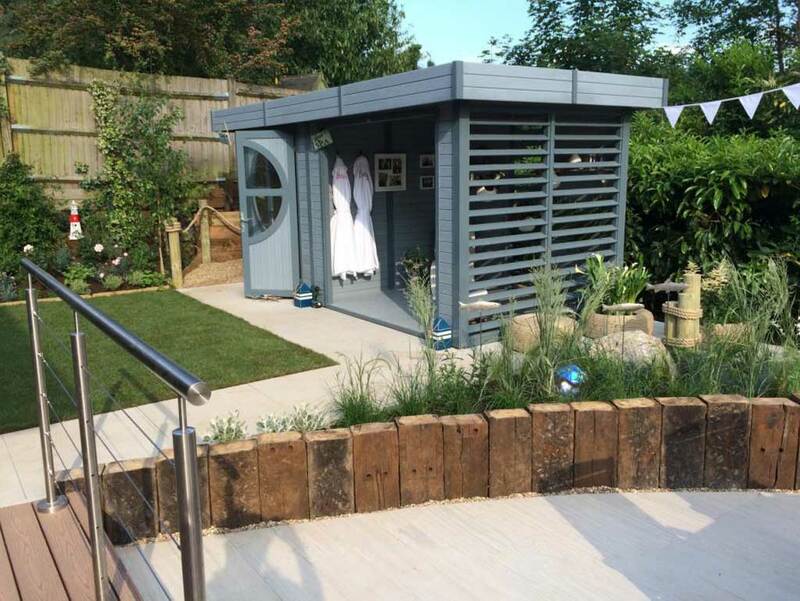 We were able to create a beautiful Spa for Rosie to sit and view her new garden from and at the same time provide a place to hide away the garden tools and machinery. It also comes with a stylish and attractive porthole window that was perfect for our ‘Nautical’ theme. 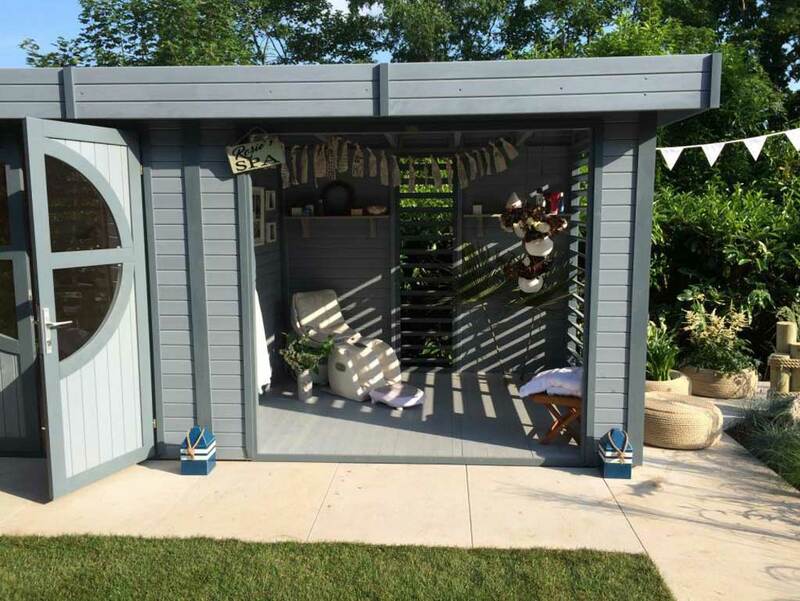 The Connor Cabin will make a gorgeous addition to your garden for years to come, providing a focal point that is sure to turn heads and have friends and neighbours talking! As well as looking fantastic. The door can be placed on the left or right hand side to suit your style. No specialist tools are needed for assembly and the lockable doors can be placed on either side to suit your taste and requirements. The Rowlinson Connor Cabin is also available pre-painted for those who may be short of time – or perhaps just cannot wait to get this masterpiece erected in their garden. Please go to Rowlinson Garden Products at www.rowgar.co.uk for more information. Rosie requested a shady seating area and what better way to transport her to a sunny desert island than with the Kookaburra Triangle sail shade from Primrose. Nothing feels more like being in your own private paradise than sipping a cool drink in a hammock seat under a Sail. 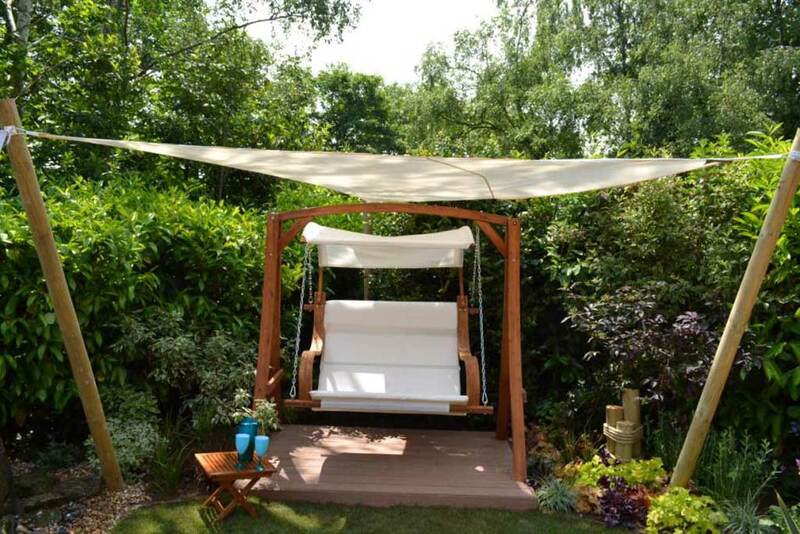 This product is easy to erect and comes in a range of sizes and colours to suit your needs. Beautiful, useful and festive, perfect for adding decoration whilst bringing a little comfort to those (few but glorious) hot, hazy days outside. 2 year manufacturer’s warranty as standard and water resistant. It also comes in Charcoal, Sand, Terracotta and Green. These portable shades can be set up just about anywhere. An array of attachment accessories is available to fit the shade to walls, trees, fences, posts or alternatively you can use one of the Sail Poles available from Primrose. The Kookaburra Sail Shades come in a variety of other sizes and at £19.99 you will still have money left over for your world cruise! Rosie and her husband Tony love entertaining their family and friends so needed paving that was hardwearing and durable (especially with their grandchildren and their toys!) as well as beautiful. We also needed it to fit with our nautical theme so the Madera paving with its real wood look was perfect to imitate the ship’s deck as well as add a fresh clean feel. The Grand Natural Sandstone reminded us of far flung places and sandy beaches, so that was perfect too! Bradstone are one of the lead suppliers of stone paving, garden walling and driveway products. They design and develop products that set the standard for quality, performance and visual appeal. The philosophy behind their range is to provide inspiration to their customers so they can create the perfect outdoor space. They also pride themselves on being world leaders in responsibly sourcing their products to ensure they are sustainable, future proof and ethically traded. 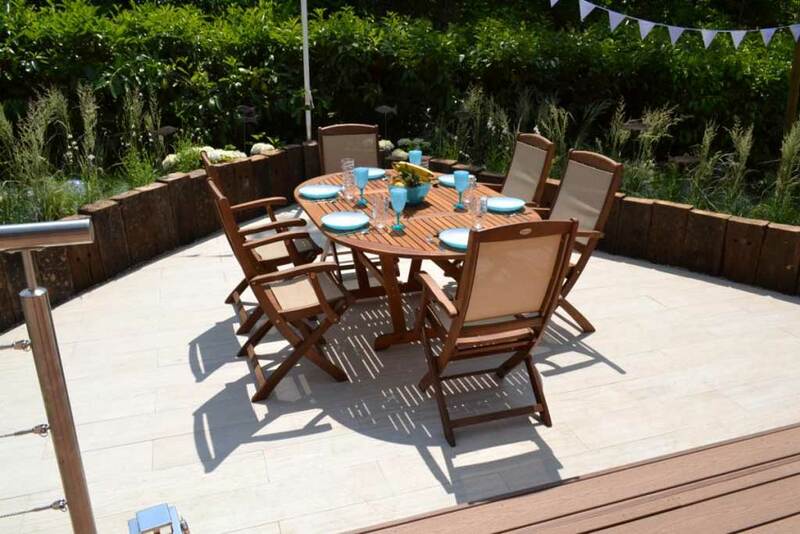 We used Madera Birch Porcelain Paving, from £65 per sq. m and Grand Natural Sandstone, from £55 per sq. m.
No cruise liner would be complete without a traditional maritime handrail to hold onto as you climb aboard or to lean on as you look out over the ocean stretching out before you. 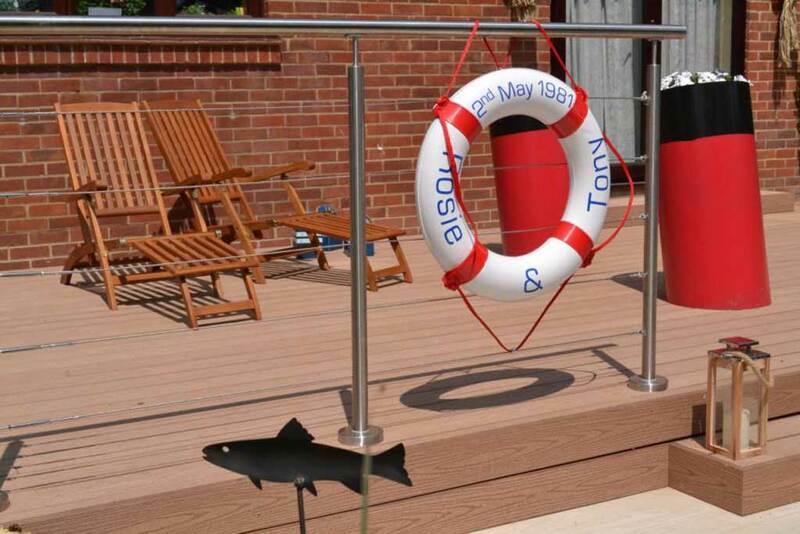 So when we saw this Wire Rope balustrade from SHS Products we knew it was perfect for Rosie’s Garden / cruise ship. It gives a contemporary twist on a design classic. SHS Products is a UK company whose Directors have over 25 years’ experience designing, manufacturing, supplying and installing stainless steel and glass balustrade solutions for both homes and businesses who always strive to deliver exceptional quality and service. No job is too big, or too small, to warrant their undivided attention and the quality for which they are known. Customers benefit from their in-house surveyors, bespoke design and technical knowledge. They also belong to the Guild of Master Craftsmen, British Stainless Steel Association and carry the Made in Britain badge with pride. We used the Wire Rope Balustrade which is £99 per metre. All aboard!!! Every ship needs a deck for its passengers and the HMS Rosie is no different. We wanted Rosie’s deck to look as much like a classic ship’s deck as possible whilst remaining functional and practical. We found the ideal product with TimberTech as they have always strived to provide composite deck boards that look as much like real wood as possible, and Reliaboard is their most authentic wood effect decking to date. The flat-grain boards are almost indistinguishable from freshly-felled timber, making Reliaboard one of the most attractive decking options on the market. If you’re looking for a decking material that offers an authentic wood look without compromising on quality or durability, TimberTech’s Reliaboard range is perfect for you. 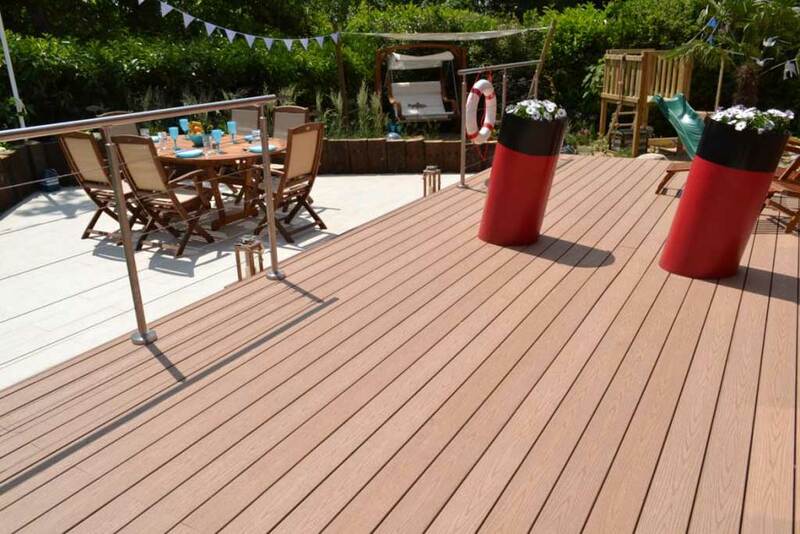 As with all of their decking products, Reliaboard never needs to be sealed, sanded or stained – it’s fantastically durable, and far more robust than standard wooden boards. Available in Cedar and Grey. We used the ReliaBoard Decking In Cedar at £55 per sq. m.